PRINCETON, NJ -- Despite President Barack Obama's renewed focus on the nation's economy this summer, he scores worse with Americans on the economy than he did in June. His approval rating on the issue, now 35%, is down seven percentage points, and his ratings on taxes and the federal budget deficit are each down five points. During the same period, his overall approval rating is down three points. Obama's approval ratings on race relations, terrorism, and education remain positive on balance, with each changing little since Gallup last measured them. His approval ratings on foreign affairs, immigration, and healthcare policy are all moderately negative but little changed. The latest results are from Gallup's Work and Education survey, conducted Aug. 7-11. 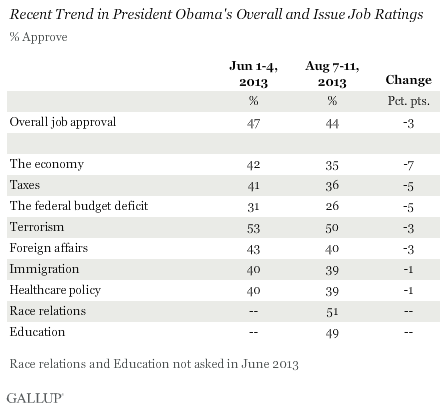 Between the June and August surveys, Obama's overall job approval rating dipped three points, from 47% to 44%. While this is not large enough to be statistically significant, it is consistent with the four-point decline shown separately in Gallup Daily tracking, from 48% in the first week of June to 44% in the first week of August. Hence, it seems clear that Obama's approval rating has sagged a bit this summer, a finding that could be linked with the larger declines in his economic performance ratings. While Obama's job rating on the economy is down from June, and on the low end of the range Gallup has recorded since 2012, it is still better than the 26% it fell to in the summer of 2011. That period represents a recent low point for Americans' views of both Washington leaders and the economy, owing to the clash between Obama and the Republicans in Congress over raising the federal debt ceiling in July 2011. It may be summer, but Americans are not all smiles and sunshine, at least when it comes to their ratings of Washington leaders. Gallup's August polling finds Americans' scant approval of Congress remaining low at 14% this month, while their satisfaction with the direction of the country slipped six points to 22%, the lowest since March. In this context, it is not surprising that Obama's overall job approval rating is at a low ebb for the year. What's more notable is that, despite ongoing debates about immigration policy, implementation of the Affordable Care Act, and Obama's approach to race relations in the wake of the verdict in the George Zimmerman trial, Obama's ratings on those issues are largely unruffled, while his ratings on the economy have suffered. Obama in turning to economic matters thus has his focus in the right place; but until the economy makes more impressive gains, ultimately reflected in improved economic confidence, Americans may not reward him with higher approval. Gallup's U.S. Economic Confidence Index rose to -10 last week, from -14 the prior week. Americans' ratings of current economic conditions and their outlook for the future each improved by four points. U.S. satisfaction suffered a setback this month, after a two-month upswing. Satisfaction is down among all party groups. This is despite the slight improvement seen in Americans' economic confidence.